zulu`s 1000`s of em wrote: Target achieved, . HaT have always been the premiere 1/72 figure company ( vast range, MAC & now crowdfunding). My Zulus will be all the better, and much larger, when the UMs arrive. I have not posted an update for a while, so here goes , the crowdfunding page now has photo`s of the figures painted up , you can still order these and get the bonus figures, quantity depends on how much you order. If you have never looked or not looked for a while why not take a look. The Zulu-Set ist nice, but the price is to much... over the crowdfunding you pay 15 USD for 4 sprues (no box) + bonusminiature + shipping. On the page from Hannants I can see, that the set is now in the list for 8.99 British Pound (vs. HÄT with 10.85 British Pound (= 15 USD)). "The link to buy is now up and working, just placed my order." Yeah. Me too. Over fifteen months ago. Still no sign of any zulus in the post. To be fair with all crowdfunding it is never instant, and you are not alone ,we are all still waiting, but they are being packed ready to send out as we speak so for all of us the wait is almost over. zulu`s 1000`s of em wrote: ...so for all of us the wait is almost over. A wait of 15 months and none still not in the post! Beano Boy wrote: A wait of 15 months and none still not in the post! Let me think, I've been waiting for Danish Napoleonic figures for about 20 years. I'd love 1/72 Belgian Nap Carabiniers but that's been decades and nothing yet. How about French Colonial troops? Many, many years but not a one. 15 months is but a dottle. And with the assurance of the figures at the end of it. I've willingly paid a small price for something I want. I suppose I could be churlish about the wait but, really, without a kickstarter, the wait may have been interminable. At any rate, I think only those who subscribed should be allowed an opinion on the length of the wait. Everyone has the right of opinion Donald even you way up there in Scotland. Beano Boy wrote: Everyone has the right of opinion Donald even you way up there in Scotland. Opinions can be very, very wrong of course. I've never seen it mentioned he was downunder before. The flag is misleading. Now you can get back to Zulus. In the first place this is definitely the most overpromoted topic here and in several other 1/72 forums. Quite a relief to know that Alan got his scarcely dressed bachelor spearman finally! It only took 10 years of pesky lobbying and the near bankruptcy of Hät to fulfil the task. Not interested into a wild muckraking or similar nonsense, but maybe we should remember the independent nature of Bennos forum?! It is certainly not the best place for further one-sided Hät-jubilating reports. Mind you, the manufacturer already owns a restricted forum & Alan, Phil and other fanboys host an equally handled “Discussion Group“ at FB. Plenty of regulated advertising space I would think. So, Donald, there seem to be many enthusiasts who have an opinion on the latest Hät sets and the company’s fuzzy marketing strategies. This forum is just the perfect place for them to discuss this in a free & open way, don‘t you agree? Haven´t we been here before? 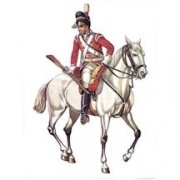 Paul wrote: Chaps...Please stick to the subject at the head of the thread, namely the Crowdfunding of the dragoons. Please stick to the subject and please restrict critique to the bods. I´ve got way better things than having to write this and there´s worst things happening in the world to complain about. Paul wrote: Please stick to the subject and please restrict critique to the bods. As far as I can tell from pictures, the figures look fine. My real criteria will be if they look younger, slimmer, fitter than the HaT set of Married warriors. There would be no point in the set if it's just a matter of head rings. I could've removed the ones from the first set easily enough. Whilst not wanting to wonder off topic, two points Eric, first is I am still waiting to get my Zulu`s although they are on the way at last. Second point, Hat`s recent activity is in no small part due to the success of the Zulu`s , so far from causing near bankruptcy as you put it , it has in fact helped get it back up and running, and with luck turning out lots of new sets in the future, no need to thank me, getting the Zulu`s is thanks enough. zulu`s 1000`s of em wrote: Whilst not wanting to wonder off topic, . well, you just did! Honestly, can´t this be carried on using the Chat or PM ? I´m off to bed now. If this goes the way I´m hoping, ie; sticking to the Topic, then I (or another Mod) won´t have to lock it tomorrow.